2 March 15 marks World Consumer Rights Day. A Lamborghini has been sacrificed on live microblogging Sina.com.cn. But why? March 15 marks World Consumer Rights Day. A Lamborghini has been sacrificed on live microblogging Sina.com.cn. But why? According to Nan Han announcement that he posted onto the internet, he decides to smash the car on the World Consumer Rights Day to vent his disappointment at Lamborghini’s differentiated services in China and Europe. 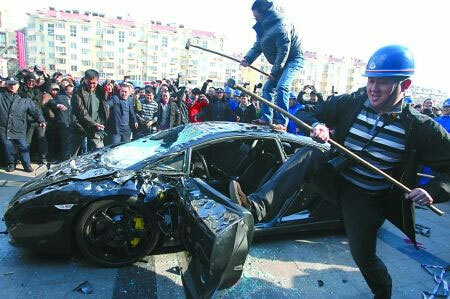 Dissatisfied by the service dealer in Qingdao, he invited his employers to destroy the luxury car. Nan Han began having problems almost immediately. 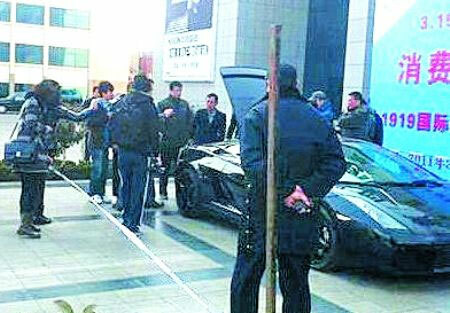 He has thus brought to the Lamborghini dealership in Qingdao. But after the “repair”, not only the engine problem was not resolved, but the bumper and the chassis were found damaged, without receiving an explanation. He tried to get in touch with Lamborghini’s China headquarters, its after-sales service manager for Asia-Pacific region, and the brand’s owner Volkswagen Group, but the problem was not solved. 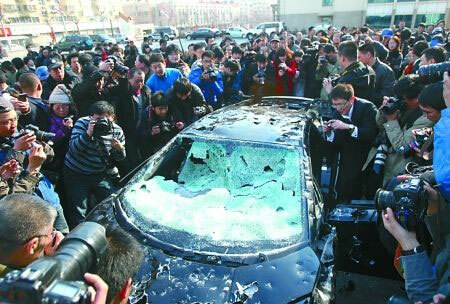 He organized this happening in front of Qingdao 1919 International Building Material and Lamp Mal, inviting some of his employees to smash the car.